Forest Research Institute has released a notification for the 98 Technician, MTS, and Other Vacancies. Therefore, we have provided the Forest Research Institute Recruitment 2018-2019 details in this article. So, aspirants need to refer the whole page to get all the particulars about the Forest Research Institute Notification 2018-2019. In addition to this, we have gathered the Educational Qualification, Salary, Age Limit details in the below sections of this page. Hence, the candidates who are ready to apply for the Forest Research Institute Recruitment 2018-2019 can get the details from this page. Moreover, refer all the sections which are provided in this post to get the more clarity related to the FRI Recruitment 2018-2019. And, the last date to submit the application is 21st April 2018. In addition to this, contenders can find the Steps to Apply For The Forest Research Institute Recruitment 2018-2019 at the bottom of this post. 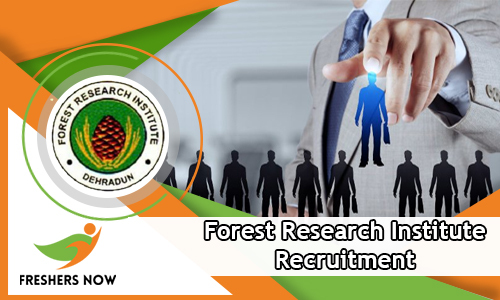 Many of the aspirants are waiting for the Forest Research Institute Recruitment 2018-2019. So, a few days back the FRI has announced the notification details. Hence, the applicants who are interested to work in forest department can apply for the Forest Research Institute Notification 2018-2019. In addition to this, before applying check the details and then apply for the FRI Recruitment 2018-2019. So, we have provided the detailed information on this page. And, we have arranged the more details in the below tabular format. hence, candidates can refer the table to know the more particulars regarding Forest Research Institute Recruitment 2018-2019. So, the interested aspirants need to apply fastly on or before the last date. Moreover, from the above table candidates can know the official website of the FRI. Hence, applicants can check the more details in the official web portal. In addition to this, we have also provided the same details on this page. Furthermore, verify all the details of the Forest Research Institute Recruitment 2018-2019 before starting the application process. At the bottom of this post, we have provided the link to download the official notification of the FRI Recruitment 2018-2019. Technician (Electrician/ Plumber/ AMO/ Carpenter/ Welder): Candidates need to pass minimum 10th Class Pass from a recognized Board with ITI certificate in relevant trade or certificate course from a Government recognized Institute. Technician (Field / Lab Research): Matric with 12th Class in Science with 60% marks in aggregate from a recognized Board. Technical Assistant (Maintenance): Bachelor degree in Science in the relevant field/ specialization or equivalent from a recognized University (OR) 03 years Diploma in Engineering in the relevant field from a recognized Institution or 10+2 with Science from a recognized Board + 2 years diploma in the relevant field from a recognized University/ Institution. Store Keeper: Minimum 10th (Matric) with 12th Class Pass from a recognized Board. Driver Ordinary Grade: Matriculation from a recognized Board. Possession of a valid driving license for Motor Cars. Experience of driving a Motor Car for 3 years or more. Lower Division Clerk: Aspirant needs to pass 12th pass certificate from a recognized Board. A typing speed of 30 words per minute in English or 25 words per minute in Hindi on manual Type Writer Or Typing speed of 35 words per minute in English or 30 words per minute in Hindi on Computer. Forest Guard: 10th Pass from a Government recognized Board. And, certificate in Fire Fighting. Multi Tasking Staff: 10th standard from recognized Board. In the above section, we have provided the educational qualification for each and every post. So, the candidates need to check the educational details before applying for the Forest Research Institute Recruitment 2018-2019. And, the organization will pay the salary of the selected candidates. Furthermore, aspirants need to attend for the Written Test followed by the Interview for the FRI Recruitment 2018-2019. In addition to this, aspirants need to pay the fee for the application process. For the fee details, candidates can refer our website regularly. Moreover, we will update soon on this page related to the registration fee. In addition to this, we have gathered the post wise vacancies list in the below sections. So, aspirants can refer the below section to know the details. And, the aspirants need to refer the official notification for the pay scale details. The Forest Research Institute will pay the salary to the candidates best in the market. Moreover, candidates can also check the official notification for more details. In addition to this, we will update further details soon on this page. Address: Forest Research Institute, Indian Council of Forestry Research and Education, Dehradun, Uttarakhand. And, more updates like Recruitment, Syllabus, Previous Papers, Admit Cards, Answer Key and Result check our web portal Freshers Now. We think the given post on Forest Research Institute Recruitment 2018-2019 is helpful to all the aspirants.